A Lumenier Mini RGB LED Pop Up Race Gate for FPV racing. Hundreds of color / effect combinations. 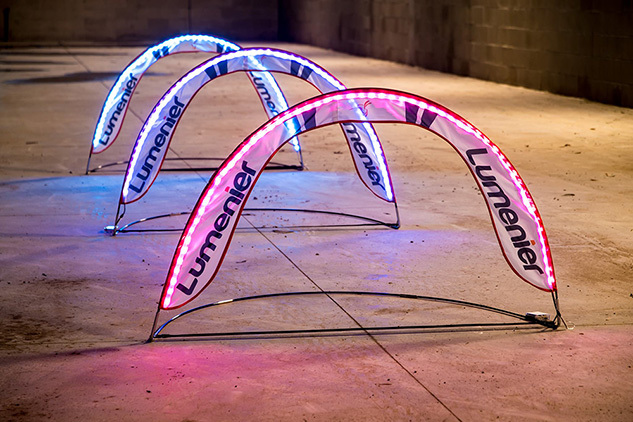 The Lumenier Mini RGB LED Pop Up Race Gate was designed for both indoor and outdoor FPV racing. Each gate has an integrated full color, super bright RGB LED strip with hundreds of color and effect combinations. Program colors or patterns of each gate with the press of a button. These gates really shine at night, lighting up the FPV course with style! Each gate comes with a travel bag and easily breaks down for transport. They are freestanding and don't require any posts or supports to sit up. Two metal stakes are included for added stability during outdoor use if desired. Each gate is powered via 3 AA batteries (not included) and will run for many hours of continuous use. The RGB LEDs are controlled via an included RGB LED programmer. Color change is as simple as pressing a button. The gate features durable and strong fiberglass poles along with a solid chromed steel base. The fabric cloth is light weight and UV resistant, so it will be sure to last a long time and many races.